The Battle of Second Bull Run / Manassas was the 88th's first major engagement, and they acquited themselves well. The 88th suffered twenty-nine killed, sixty-five wounded, and as many as 106 missing in action. It was the highest total losses in killed they will suffer in any one battle throughout the coming years. Companies C and D were particularly hard hit and each suffered eight soldiers killed. In order to draw Pope’s army into battle, Stonewall Jackson ordered an attack on a Federal column that was passing across his front on the Warrenton Turnpike on August 28th. The fighting at Brawner Farm lasted several hours and resulted in a stalemate. Pope became convinced that he had trapped Jackson and concentrated the bulk of his army against him. On August 29, Pope launched a series of assaults against Jackson’s position along an unfinished railroad grade. The attacks were repulsed with heavy casualties on both sides. At noon, Longstreet arrived on the field from Thoroughfare Gap and took position on Jackson’s right flank. Ricketts’ Division of which the 88th was a part moved toward Bristoe Station where the troops halted for a few hours then resume moving eastward, fording Broad Run Creek and continued to march along the O&A rail line to Manassas Junction. Counter-marching, the troops doubled back and marched to the northwest on the Gainesville-Manassas Road, then turned north onto Sudley Springs Road. Then marching to the far right of the Union line and halted briefly. The troops then countermarched southward again towards the Warrenton Pike. They halt just behind King’s Division on Sudley Springs Road, just north of Warrenton Pike, and bivouac near the Henry House. On the morning of August 30th, Ricketts’ Division is drawn up at the Dogan Farm, where they were issued rations and placed in reserve. Pope renewed his attacks, seemingly unaware that Longstreet was on the field. When massed Confederate artillery devastated a Union assault by Fitz John Porter’s command, Longstreet’s wing of 28,000 men counterattacked in the largest, simultaneous mass assault of the war. The Union left flank was crushed and the army driven back to Bull Run. Only an effective Union rearguard action, in which the 88th was a part, prevented a replay of the First Manassas disaster . Ricketts’ Division was attached to Heintzelman’s Corps, and placed just to the south of the old Stone House. The sounds of battle emanating from the west became more pronounced, and it became evident that a sizeable force of Confederates was moving to the Union left. 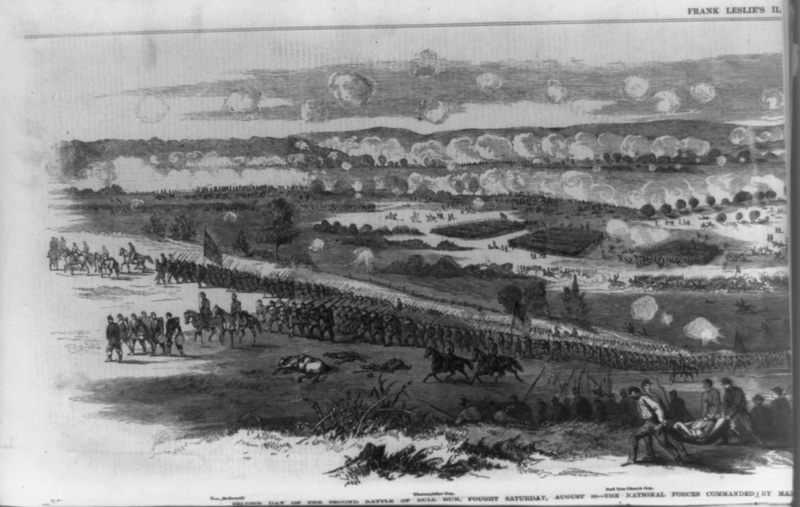 McDowell, realizing the dire situation on the Union left flank, ordered Tower’s Second Brigade and Stile’s Third Brigade forward to Chinn’s Ridge in an effort to slow the advancing Confederate forces of General Longstreet’s Corps. Entering the field at approximately 4:30 p.m., Tower’s Brigade moved forward with the 88th in the lead. Their objective unseen, Tower’s Brigade began a 1300-yard trek to the sounds of the battle emanating from Chinn’s Ridge. The brigade crossed the Warrenton Turnpike and marched southward down Sudley Ford Road. Turning right off the road, they began traversing cross-country; moving westerly toward Chinn Ridge. A scant two hundred yards from the road, the brigade was confronted with a creek bed. The banks were very steep and the clay slick, and maintaining unit cohesion while crossing the obstacle was difficult. Realigning themselves, the brigade marched up and down the steep hills of the undulating landscape. Tired, and plagued by the unrelenting stings of the numerous thistle plants, the soldiers were none the less thankful not be in a direct line of fire by Confederate artillery. The sounds of the deep booming of the artillery and long ragged volleys of rifle fire implored them forward. At 1200 yards from their point of departure off Sudley Road, Tower’s Brigade crested the slope of Bald Hill. Before them spreads out the panorama of destruction as the Ohio Brigade vainly sought to stem the approaching Confederates. Union Zouaves of the 5th and 10th New York easily recognized by their French colonial inspired uniforms and red pantaloons, came streaming past Tower’s troops. At 5:00 p.m. Tower’s Brigade advanced into the battle area at the double quick, with Stile’s Brigade trailing behind. The 88th advanced on a company wide front. Company K, commanded by Captain Sylvester Bookhammer, is in the lead position and arrived on the battlefield first. In the ensuing action, Bookhammer was seriously wounded and was discharged the following November. Of the ten Company Commanders (or acting Company Commanders) in the 88th, three (Companies D, I, and K,) would be wounded and one (Company C) killed in the ensuing battle. No sooner did the 88th arrive on the field, than the Ohio Brigade to their front collapsed under the pressure of Longstreet’s Confederates. Fronting Chinn Ridge, the 88th drew into a line of battle on the forward southwest slope of Bald Hill. Their ranks were immediately broken as troops scurried to get out of the way of the retreating artillery carriages of Wiedrich’s 1st New York artillery battery. Straightening their ranks, and with drummers leading and flags flying, Tower’s Brigade advanced on the Virginian troops of Kemper’s former Brigade. The 90th Pennsylvania deployed on line to their right. To the rear of Tower’s troops the 5th Maine Battery with four 10-pound Parrot cannons, continued to fire their remaining ammunition at the amassed Confederates. broke through Tower’s line . . . . .from the rear. It is clear that the lack of battlefield synchronization among maneuvering Union forces contributed as much to the confusion as did the overwhelming firepower of the Confederates. 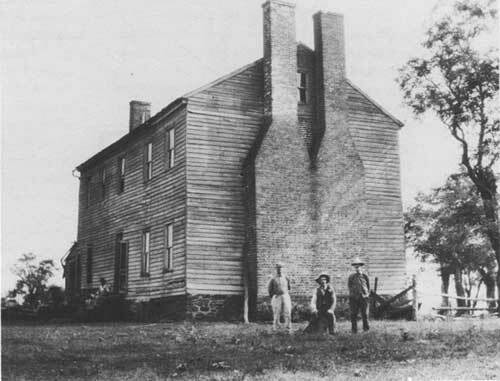 The Confederates pushed a battery of artillery up to the Chinn House and commenced firing directly into Tower’s troops. The situation continued to deteriorate as Evan’s Brigade and elements of Hood’s Division further extended the Confederate line. Tower deployed the 94th New York and 26th New York to a small valley on the 88th’s left flank, but these two regiments would soon break under the withering fire. As the line waivered, Brigadier General Tower stood in his stirrups and ordered the approaching Union troops of Stiles’ Brigade to fix bayonets and charge. Stiles entered the fight with only three regiments, and placed the 12th Massachusetts on his far right, 11th Pennsylvania in the center, and the 13th Massachusetts on his left. As Stiles’ troops pass, Tower is wounded by a shell burst that sent both him and his horse to the ground. Lt. 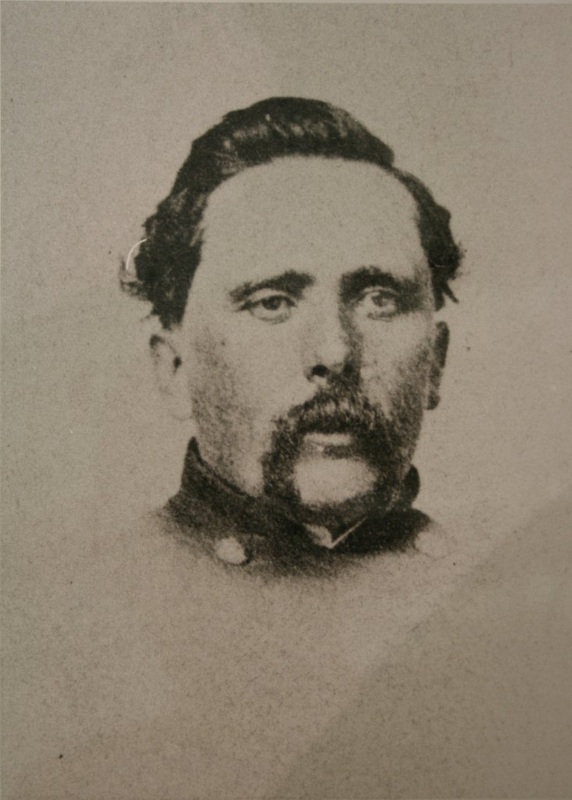 Colonel Jospeh McLean, Killed in Action while leading the 88th Pennsylvania Volunteers on Chinn Ridge, August 30, 1862.
had a minie ball pierce his forehead and exit his right eye. (He loses the eye but survives the wound and is discharged on March 11, 1863.) Lieutenant Colonel Joseph McLean, a father of nine, is bore off the field by soldiers of the 88th and of an Ohio regiment. While being carried off, McLean was wounded yet again. 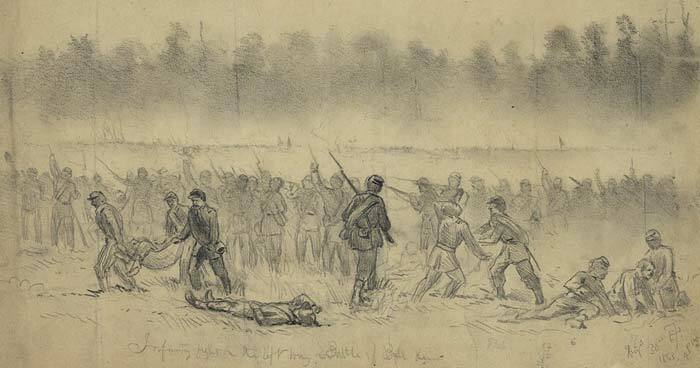 Suffering from a probable rupture of the femoral artery, McLean recognized the wound as being mortal and implored the soldiers to leave him and save themselves. A young officer from the 7th Ohio applied a tourniquet and stayed with McLean until he himself was taken prisoner. The Confederates recognizing the wound to be mortal leave McLean for the hospital attendants. McLean dies alone and to this day his body has never been recovered. As the Virginians of Corse’s and Kemper’s Brigades surged forward, the Union line broke. The 1st Virginia captured the four ten-pound Parrot Cannons of the 5th Maine. The 17th Virginia captured the colors of the 11th Pennsylvania. Colonel Fletcher Webster of the 12th Massachusetts was mortally wounded and lay not far from Lieutenant Colonel McLean; both men waiting for medical attention that never came. Following Lieutenant Colonel McLean’s death, Major Gile assumed command of the 88th. The regiment’s senior-most Captain, Louis Wagner, was also wounded and taken prisoner. He was later paroled and rose to eventually command the regiment. Captain John Belstering, the third senior-most Captain in the 88th was killed at the head of Company C. (Throughout the course of the war, 100% of the officers of Company C will either be wounded or killed.) The sacrifices are not entirely in vain, and the delaying action was successful in buying General Pope and the Pennsylvania Reserves of Brigadier General John Reynolds’ Division a short time to organize defenses on Henry’s Hill, but the cost is tremendous. Brigadier General Tower was wounded in action, and his brigade suffered 68 killed, 338 wounded, and 292 missing for a total of 696 soldiers. The 88th suffers twenty-nine killed, sixty-five wounded, and probably as many as 106 missing in action. It is the highest total losses in killed they will suffer in any one battle throughout the coming years. Companies C and D are particularly hard hit and each suffers eight soldiers killed. By way of comparison, the Morning Report dated August 17, 1862 reflects 565 men present. The Morning Report dated September 3, 1862 reflects 344 men present. Statistically, this represents a loss (from all sources) of 40%. Based on the assumption that the 88th entered the Battle of Second Manassas/Bull Run with 565 troops, the regimental loss for the battle would be 28%. Historian and Civil War Author Scott Patchan Discussed the Fight For Chinn Ridge. Scott Patchan, author of the book "Second Manassas: Longstreet’s Attack and the Struggle for Chinn Ridge" , discusses the fight for Chinn Ridge in this series of videos from the Civil War Trust. of 75,696 troops engaged . Tower's Brigade suffers 66 killed, 338 wounded, and 292 missing for a total of 696 soldiers. The Eighty-Eighth suffered 29 killed, 65 wounded and as many as 106 missing for a total of 200 men out of a possible 565 men engaged. Confederate losses were 1,481 killed, 7,627 wounded, and 89 missing totaling, 9,197 out of 48,527 troop engaged.